This striking 75th Anniversary edition of this Newbery Medal-winning historical fiction classic is updated with new jacket art and an illustrated foreword from author-illustrator Nathan Hale. 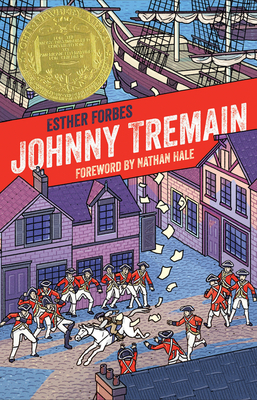 Johnny Tremain is one of the finest historical novels ever written for children. To read this riveting novel is to live through the defining events leading up to the American Revolutionary War. Fourteen-year-old Johnny Tremain, an apprentice silversmith with a bright future, injures his hand in an accident, forcing him to look for other work. In his new job as a horse boy, he encounters John Hancock, Samuel Adams, and Dr. Joseph Warren. Soon Johnny is involved in pivotal events from the Boston Tea Party to the shots fired at Lexington. For this anniversary edition, Nathan Hale brings his distinct graphic-novel storytelling to a new foreword. Esther Forbes (1891-1967) garnered a Newbery Medal and an enduring place in children's literature with the publication of Johnny Tremain. Her adult novel, Paul Revere and the World He Lived In, won the Pulitzer Prize for history in 1942. Nathan Hale is the author and illustrator of the Eisner-nominated, New York Times bestselling graphic novel series on American history Nathan Hale's Hazardous Tales. He is the illustrator of the graphic novel Rapunzel's Revenge and its sequel, Calamity Jack. He also illustrated Frankenstein: A Monstrous Parody, The Dinosaurs' Night Before Christmas, and many others. Visit him at spacestationnathan.blogspot.com.